Here’s what to expect in your MDI Reports. individual Measures, the Well-Being Index, and the Assets Index. Each of the 5 Dimensions of Well-Being are comprised of several measures that combine answers to one or more questions on the survey. Your reports use bar graphs to show the number of students categorized as having low, medium, or high well-being on each of the included measures. These bar graphs illustrate what’s already working in your school or community, or areas where your kids may need some extra support. These graphs also show the average for students across all participating districts, illustrated by a vertical line overlaid on each bar. These bars show how your MDI results are similar or different from this average. 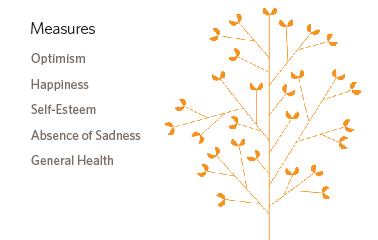 Although middle years well-being is comprised of all measures across the five dimensions, there are five measures which have the best predictive value, and can be considered to serve a a useful snapshot when combined: Happiness, Optimism, Self-Esteem, Absence of Sadness, and Overall Health. The Well-Being index tells you at a glance how many students are thriving according to these five key measures. On the MDI, children who are reporting positive responses on at least four of the five measures of well-being are considered to have high well-being. In addition, children in this category are reporting no low scores across these measures. These children are frequently demonstrating the characteristics of a thriving child. Children reporting positive responses on fewer than four measures and neutral responses (e.g. ‘neither agree or disagree) on the remainder are scored in the Medium to High Well-Being category. These children also report no negative scores on any of the five measures included in the index. Children in this category may also demonstrate thriving characteristics, but do so less frequently than children in the Thriving category. Because each of the 5 measures of well-being included in the Index are so critical, our scoring system places children reporting one or more negative responses on the measures in the ‘Low Well-Being’ category. The index, then, can serve as an “early warning system” or “red flag” and shows the percentage of children who are experiencing difficulties in one or more areas of their life that contribute to their overall well-being. 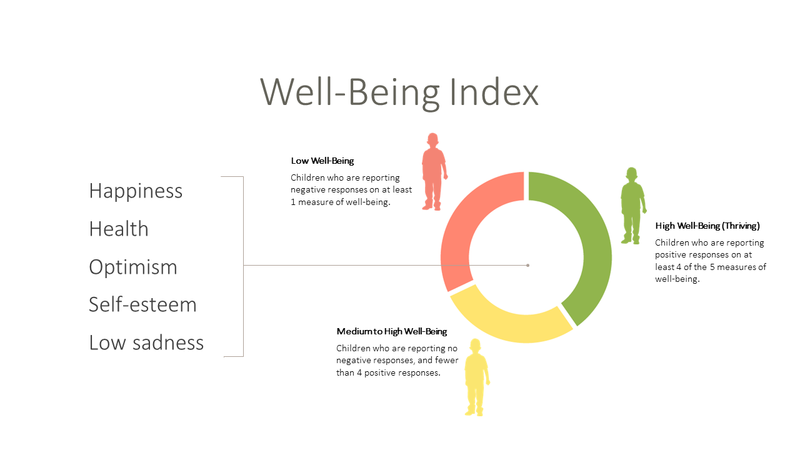 While the measures that the Well-Being index combines are qualities about the child, the Assets index combines measures that represent outside factors that can help support well-being: Adult Relationships, Peer Relationships, Nutrition & Sleep, After-School Activities, and School Experiences. * Assets are considered actionable meaning that schools and communities can their focus efforts in these areas to create the conditions for children to thrive. This index provides a quick and comprehensive way to see where your school or community is providing best support to children, and to understand how this changes over time. This is one area in which adults perceptions and children’s self-reports may differ considerably, and reminds us that an offering or availability of asset-related resources and services, doesn’t necessarily mean that children feel their presence in their lives. For each of these critical assets, the index reports the percentage of children who indicate the presence of the asset in their lives. Use this index as a starting point for conversations with children and others to determine how to best invest in supporting their well-being. * The School Experiences asset data is not visualized as part of the Assets Index to prevent the ranking of individual schools or districts. For more information and data related to School Experiences, please see ‘School Climate’ and ‘Bullying and Victimization’ measures here.